In Canine Heaven - "Training humans one dog at a time." 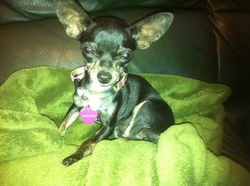 ﻿"The dog is a gentleman; I hope to go to his heaven, not man's"
Macy Mae, a teacup Chihuaha, was a joy to have in my life. She came to me through a client and was in need to give this sweet girl a home. About the size of a guinea pig, I took her in and gave her all the love in the world. Although she was only a part of our pack for a short while, she added a spunky yet sweet personality. She had no problem playing with the big dogs, and at most times took charge. Macy unforutantely passed of unknown causes. In a matter of two weeks she lost a pound of her 2.5 lb body weight. All the tests came back negative. Her weight finally started to come back, but the morning of October 5, 2011 she had passed on in her sleep. She is certainly missed and added such a unique and interesting personality to the pack. Dante William is a purebread Beauceron with a heart of gold. Although a big dog weighing in close to 110 pounds, he was nothing but a lap dog. His looks are deceiving as all he wanted to do was be your friend and lick you uncontrollably. He was a huge part of my life and will never forget the experiences and people he had me meet. Without him my life would have been very different and he is the definition of "everything happens for a reason." On the morning of January 22, 2011 he suddenly collapsed on the kitchen floor. He was rushed to the emergency vet in attempts to figure out what was wrong. Dante passed at the veterinarian from a heart disorder as the attempts to revive him were unsuccessful. He was and still is a big part of the Canine Manners' heart and is dearly missed.